Despite having started constructing the raised veg beds back in October, further progress has been a little slow due to the high number of distractions in the intervening months. One thing is becoming very clear since we moved here, it’s all too easy to find yourself with many projects started but none fully completed! With these new raised veg beds, the intention was always to come up with some covers to help extend the growing season but initially I had no particular approach in mind. 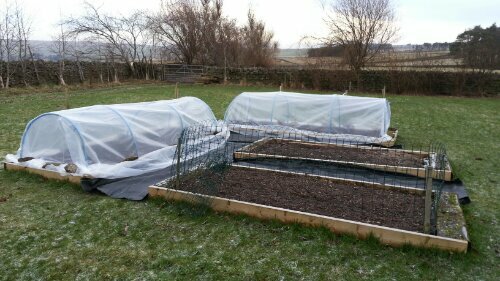 Finally the delays got to me so I ordered some supplies from Premier Polytunnels including a decent length of polythene to use as a cover. At the same time, I took the opportunity to order a decent length of ground cover fabric to go in between the raised beds. It seems wise to get that in place sooner rather than later! In an earlier post I showed the first stages of adding the water pipe hoops on one of the raised beds but with an hour or two to spare last weekend I finally completed the work on two of the four raised beds. This new area alone is more growing space than I had in the last house never mind the original vegetable bed here which is also expected to be fully utilised this year. At least I can relax now if the chickens decide to invade the garden because the onions and garlic (on the left) and soft fruit bushes (at the back) are suitably protected. The onions in the nearest bed will just have to take their chances for the moment with a low fence around them – it seems that the chickens can’t be bothered to flap over that. There is still some final work needed to properly tighten up the covers so that they can survive any bad weather but I’m still contemplating the best way of attaching the polythene to the raised veg beds. I’d like to make it completely removable if possible but perhaps it’s better to just attach it on one side so that it can be rolled back if needed. There was always plans for another raised bed in this area but I’m inclined to hold back on that in case I take on more than can be properly managed in the coming year. Having said that, I usually buy far too many seeds each spring so I may hurriedly build something once I’ve filled up all other available space.